O God, whose Only Begotten Son entrusted Mary Magdalene before all others with announcing the great joy of the Resurrection, grant, we pray, that through her intercession and example we may proclaim the living Christ and come to see him reigning in your glory. Who lives and reigns with you in the unity of the Holy Spirit, one God, for ever and ever. Mary Magdalene wasted the great beauty that God had given her in a life of sin, but one day she saw Christ and was touched by grace. On the day of our Lord's crucifixion, she stood with the Mother of Jesus at the foot of the cross. At early dawn on the first Easter morning, Mary Magdalene and other women who had ministered to Jesus went to the Lord's sepulcher. Two angels said to them, "He is not here, but is risen....Go, tell his disciples." Mary Magdalene ran to tell the Apostles what she had seen and heard. Then Peter and John, hastening to the sepulcher, saw and believed. The feast of St. Mary Magdalene is considered one of the most mystical of feasts, and it is said that of all the songs of the saints, that of Mary Magdalene is the sweetest and strongest because her love was so great. That love was praised by Jesus Himself who said that because much was forgiven her, she loved much. Where she is buried, no one knows. Legend has her dying in Provence, France, in a cavern where she spent her last days, and her body resting in the chapel of St. Maximin in the Maritime Alps. Another has her buried in Ephesus where she went with St. John after the Resurrection. This latter view is more likely, and St. Willibald, the English pilgrim to the Holy Land in the eighth century, was shown her tomb there. Tradition often identifies Mary Magdalene either with the sinful woman who anointed Christ's feet in Luke 7:36-50 or with Mary of Bethany, the sister of Lazarus and Martha mentioned in Luke 10:38-42 and John 11-12. By the sixth century A.D., figures such as Gregory the Great had begun to advance the notion that these two women mentioned in Scripture were one and the same person: Mary Magdalene, who hailed from Bethany and who had become a disciple of Jesus after leading a notoriously sinful life. 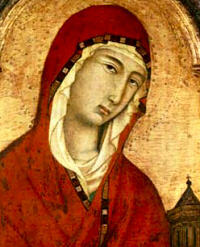 This tradition explains why Mary Magdalene was revered for centuries as the "model penitent." From a biblical standpoint, it is not impossible that Mary Magdalene could be identified with either one or both of these two women, but decisive evidence is lacking and so it must remain uncertain. She was the first recorded witness to the resurrection of Jesus, His most ardent and loving follower. She had stood with Mary at the foot of the Cross on that brutal Good Friday afternoon and had been by the side of Mary during these difficult hours. On Easter morning, she went with the other women to the tomb and it was there, in the garden near the tomb, that Jesus appeared to her. It was she who brought the news of the Resurrection to the Apostles, and Peter and John raced to the tomb to see what had happened. She was from Magadala, a small fishing town on the Sea of Galilee, between Capernaum and Tiberias. She was known to be a "great sinner," a woman of the streets who heard Jesus speak of the mercy and forgiveness of God and changed her life completely. Her matter-of-fact witness to the Resurrection moved Peter and John to go and see for themselves: "I have seen the Lord and these things he said to me." Jesus had chosen her to bring the news to them and she simply told them what had happened. She has always been the example of great love and great forgiveness, one of those close to Jesus who grasped the truth of God's love for human beings and spent her life bearing witness to that love. Patron: Apothecaries; Casamicciola, Italy; contemplative life; contemplatives; converts; druggists; glove makers; hairdressers; hairstylists; penitent sinners; penitent women; people ridiculed for their piety; perfumeries; perfumers; pharmacists; reformed prostitutes; sexual temptation; tanners; women. Symbols: Rich raiment; box of ointment; skull; book; vase of sweet spices; crucifix; open book; boat. Witnesses to Calvary: Reflections on the Seven Last Words of Jesus by Fr. Richard C. Antall is an interesting and thoughtful look at St. Mary Magdalene's place at the foot of the cross. He contrasts her deliverance from seven demons with the symmetry of the Seven Words.